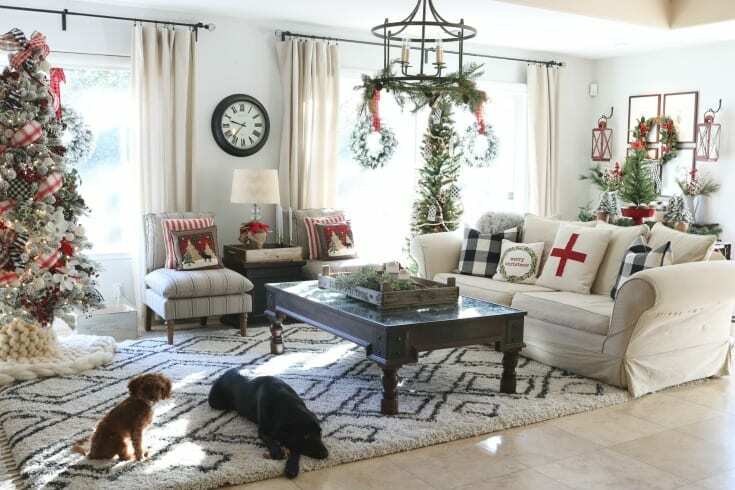 Welcome to my “Crazy for Buffalo Check” Christmas Home Tour! I am so excited to show you around my holiday home. I hope you’ve got your coffee, hot chocolate or glass of wine with you so you can sit back, relax, and really enjoy. 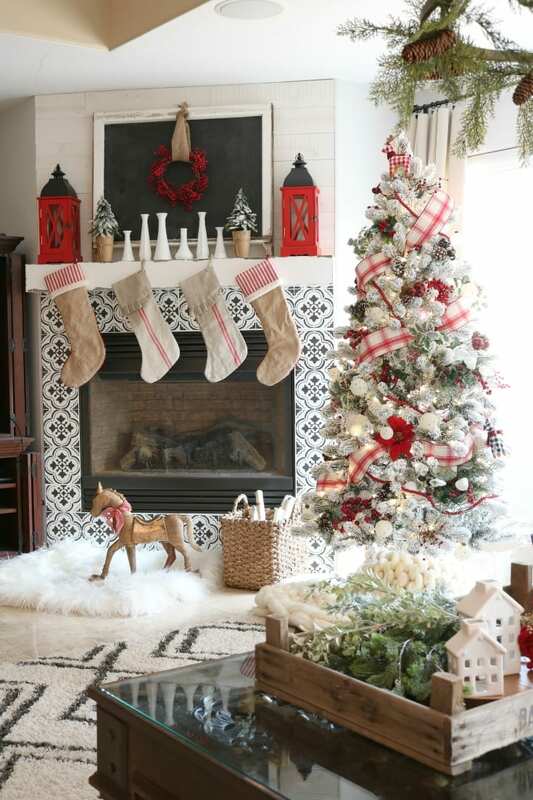 We’re delighted to be part of an inspiring group of bloggers who are each sharing their Christmas decor with you! Be sure to visit each of the blogger’s links at the end of this post. Each one is more beautiful than the next….and with so many different design styles you’re sure to find the one that speaks to you! In this post we share some of our favorite small business partners. We absolutely love supporting women in business and small family-owned businesses. You’ll find savings coupon codes that we encourage you to use. By using our codes you save on your purchases and we are able to cover some of our blogging expenses. . Your purchases also support wonderful families and their small businesses. Thank you in advance for shopping with us! 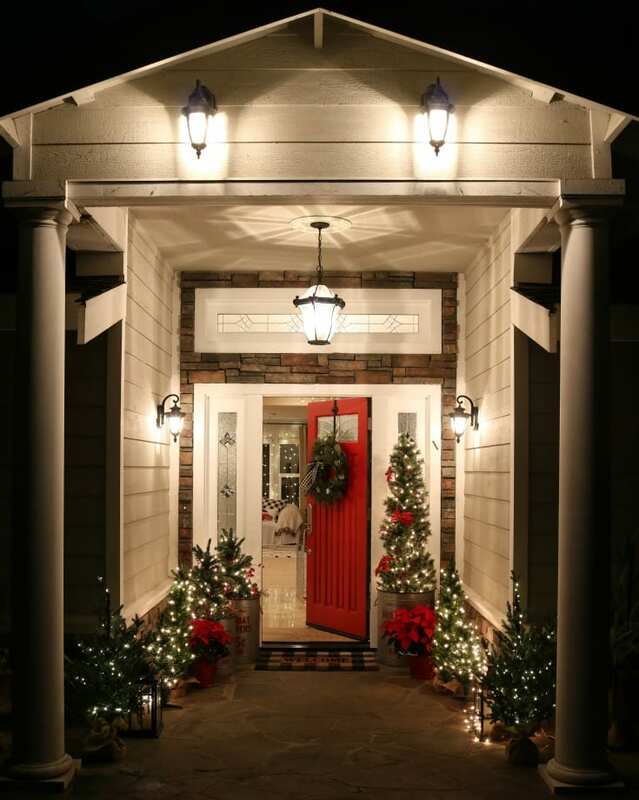 A Merry Christmas Home Tour! It’s true! I am a little crazy for buffalo check. It began over a year ago in my home decor and instead of waning it seems to only be growing. So, what’s a girl to do but GO WITH IT! We haven’t even walked through my front door yet and you can see it beginning. 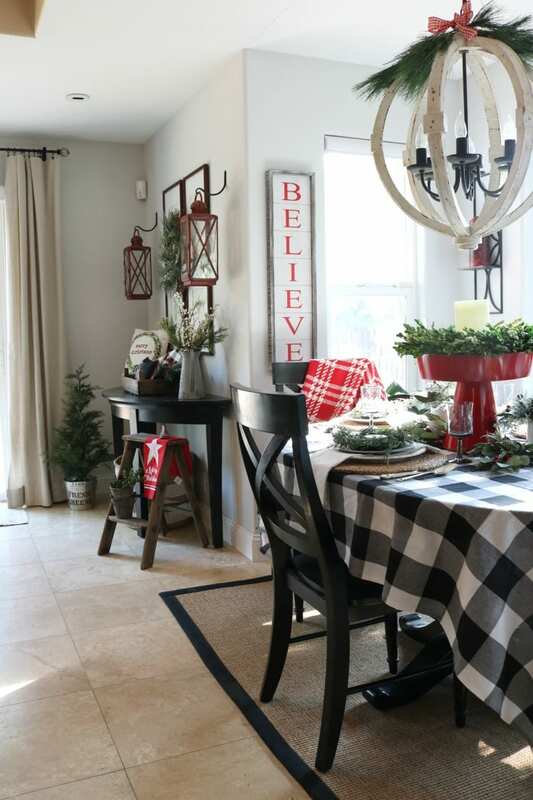 And what goes better with black and white buffalo check than traditional Christmas red? My sister thought I was a little cray cray when I told her I was going to paint my front door…again! We’ve lost count how many times I’ve painted it, but I got the idea of red in my head and couldn’t let it go. Had I known it was going to take FOUR coats of paint I’m not sure I would have had the motivation. From the street it is by far the most dazzling color we’ve had. It works beautifully with the grey and white color scheme of our home. I’m sure you’re wondering if the door will remain red…. probably not. Most likely it will go black again for the sake of decorating my porch for all the seasons. But feel free to weigh in. I always welcome your opinions and ideas. Welcome to my home! 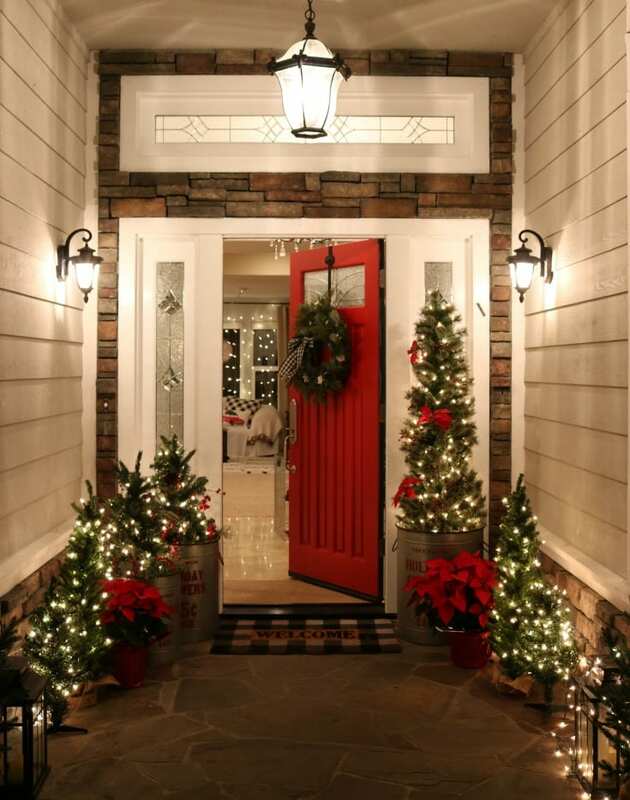 Let’s step inside…. My kitchen continues the traditional theme with plenty of reds and a smattering of green. 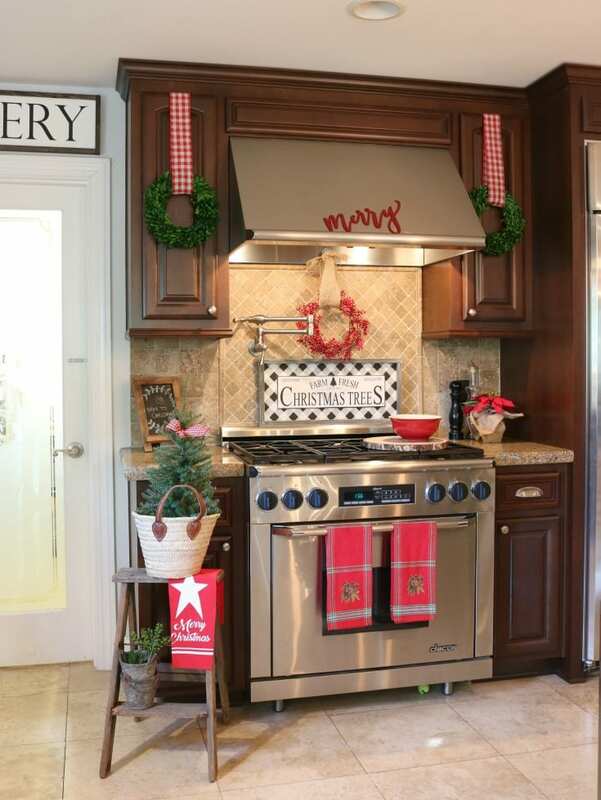 Just enough fun details to make it feel festive while we cook and do our holiday cookie baking. We love to bake our favorite Spicy Nuts and give those as gifts to friends. Click here for our Secret Family Recipe passed down from our grandmother. We also are baking our new favorite White Peppermint Holiday Cake for our neighborhood dessert party. If you haven’t tried this amazing recipe from our talented friend, Angie @busymakingpie you really must try it. Click here for the step by step recipe. I am pleased and proud to report that most of my decor is reused and repurposed from last year. I received a few items from sponsored partners and did very little spending. Did you hear that, oh sweet hubby of mine?? 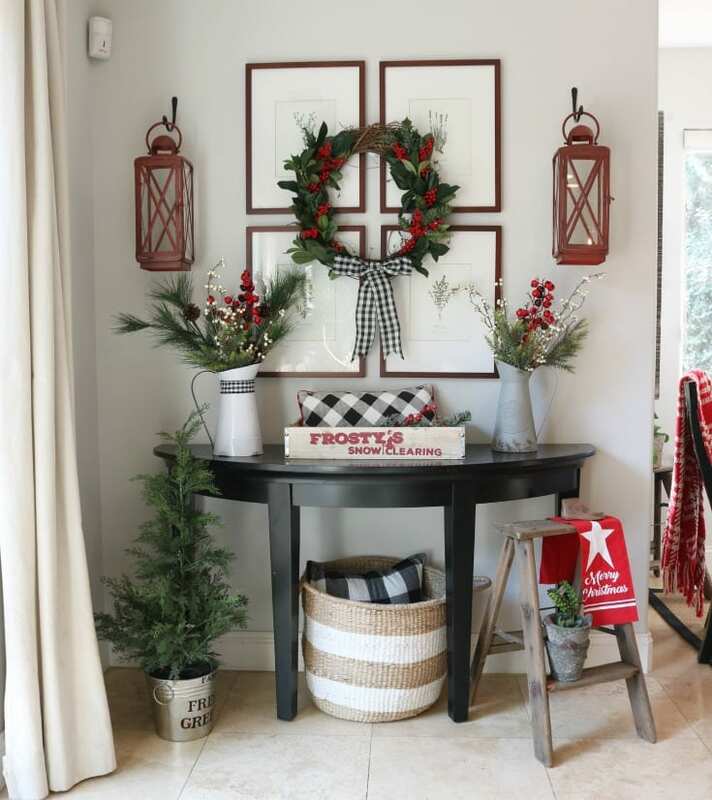 Pops of red, white and natural greens play equal parts in my Christmas home. I also love mixing rustic antiques into my decor to add vintage charm. They seem to warm up a home with their age and authenticity. 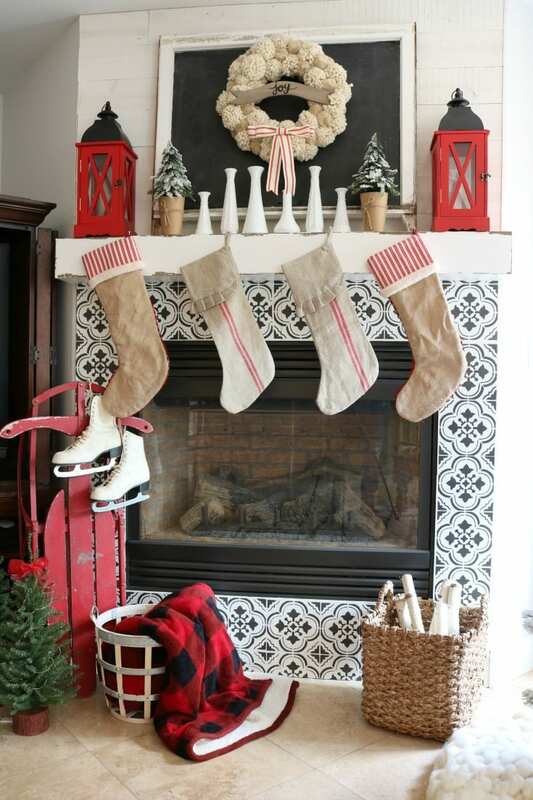 I wasn’t certain I would love my patterned tile fireplace with my Christmas home decor. It turned out that Julie and I both really liked it. 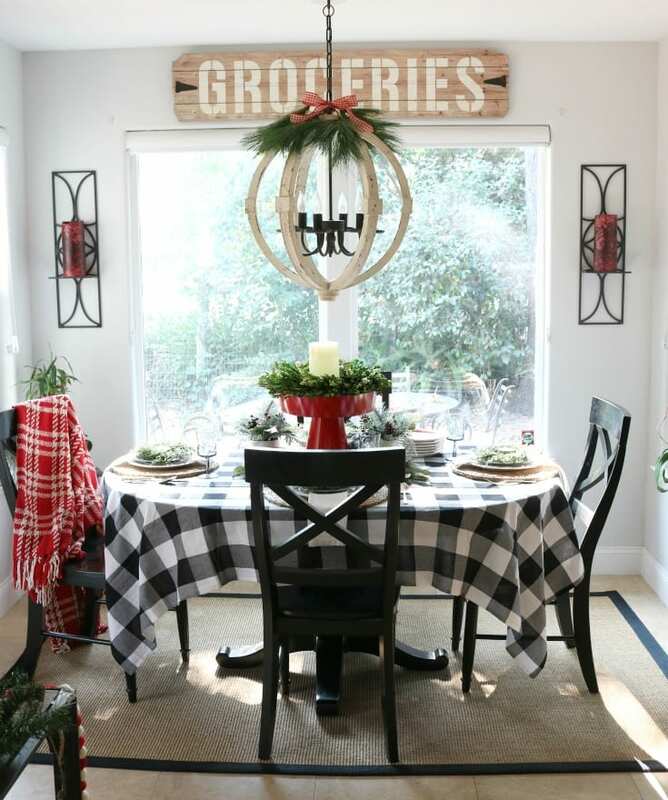 I chose enough items with black to tie in with the tile: the black and red buffalo plaid throw, the backdrop of the chalkboard, the tops of the lanterns, and the fireplace surround. This repetition of color helps to make it look cohesive instead of random. I did a few things differently this year. I chose a smaller tree next to my fireplace but I added a second pencil tree to the room for balance. 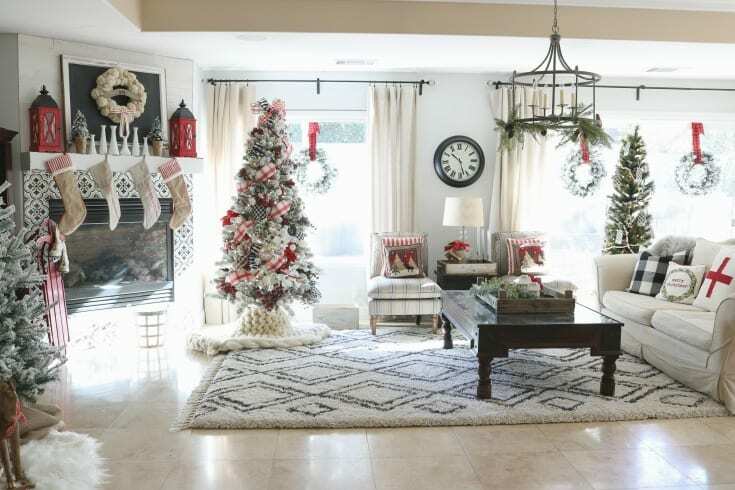 I also added flocked wreaths to the windows to create a repeating theme that would unify the different areas of this large space. Our 5 month old cavapoo Moki and our 3 year old lab Rocky both got into the picture for this one. Rocky was tired of sitting around and waiting but photographing these two is no simple task. They are playing and moving around constantly so that means it’s one big blur. Thankfully I got at least one picture where they both decided to pause. I am loving my new wreaths from our friend Jessica @the.accidental.farmgirl. They add so much to my Christmas home! Julie and I love her wreaths season after season. They are so unique and extremely well made. We have partnered with Jessica to offer a coupon code that allows you to save 15%. Use our code THEDESIGNTWINS. Visit her Etsy shop right HERE. Do you love my hand knit chunky tree skirt? It was hand knit by our talented friend Larissa @becozi. Julie and I have been enjoying her luxurious blankets in our homes for several years. Not only does Larissa knit a variety of styles of blankets but she also makes dog beds, decor items, and tree skirts like mine above. 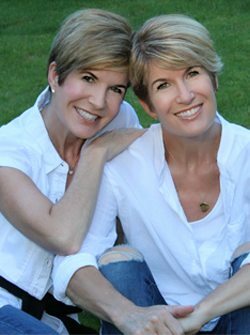 Use our savings coupon code TWINS10 to save across her entire site and shop Becozi HERE. If you would like to learn how to arm knit these blankets we teach you all you need to know in our blog post. You can also save on your yarn purchase. Visit our arm knitting tutorial blog post to learn how. Do you love adorable farmhouse pillows as much as I do? I know! Our sweetest friend Erin @porterlanehome amkes endless pillow creations and more, and we can’t get enough of her designs. One example of her pillows is above, the ruffled one. She offers customization to all her pillows. You can choose to add ruffles to any of her designs. Also, save an awesome 20% with our code THEDESIGNTWINS. She has over 500 items on her website…your toughest problem will be deciding! Have fun, though, because you really can’t go wrong. 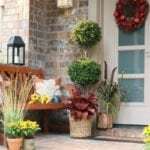 You will love to use and reuse her quality pillow covers year after year. SHOP PILLOWS HERE. You can see in the photos above and below that I have a firm belief that everything looks better with a wreath on it! The stunning wreath below is another handmade beauty from Jessica @the.accidental.farmgirl. Haha…I couldn’t resist that one. Once again, my love of buffalo check is steeling the show in my Christmas home. 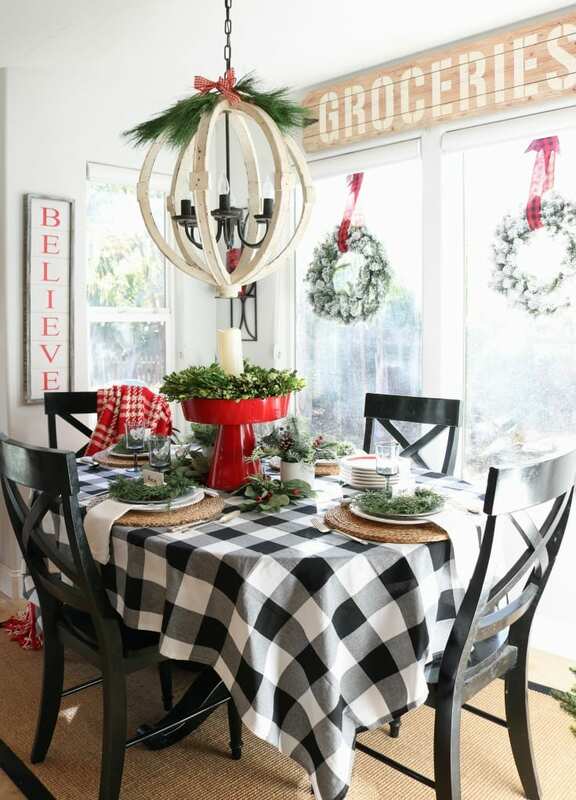 Since my table and chairs are black I think the black and white check table cloth goes beautifully and adds a wow factor. 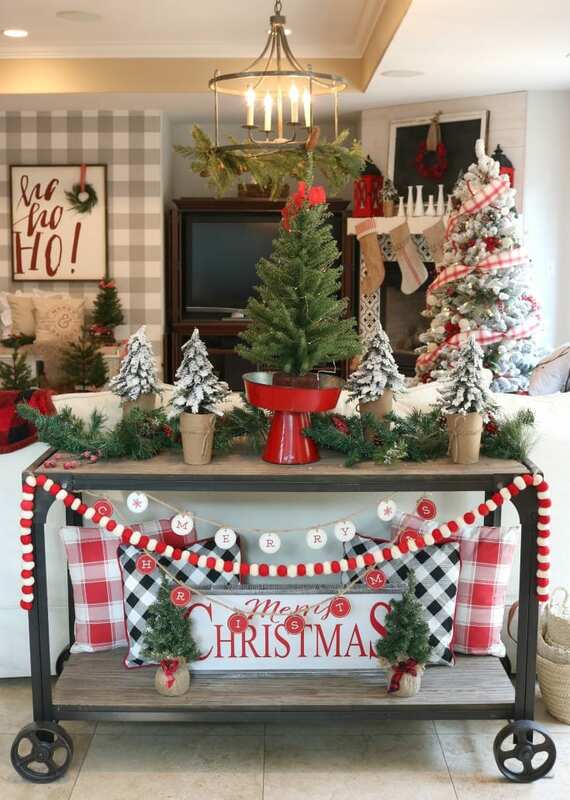 You can see I added pops of red with the metal centerpiece stand, the bow above the light, the plaid red and white throw and the two red candles. Each “pop” is strategically placed to balance this area. What do you think? What do you think? 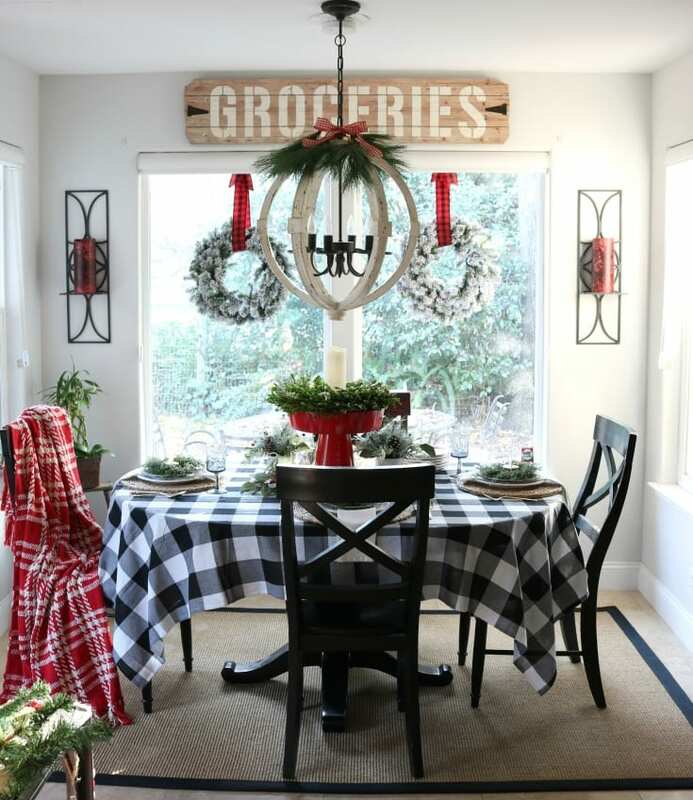 I added simple flocked wreaths to the windows and tied them with red and black buffalo plaid ribbons (of course!). I think it adds the perfect final touch, don’t you? I have been looking for a sign to put on this wall for years. I finally found the perfect sign from our friends at Krumpets Home Decor. We have a savings coupon code that works across their entire site. They have oodles and oodles of darling seasonal decor. Use our code THEDESIGNTWINS to save an extra 10%. Shop for Christmas and beyond right here. And if you love buffalo check like I do you’ll be especially excited. They have an entire collection using buffalo check designs. Winning Colors in My Master Bedroom: RED! 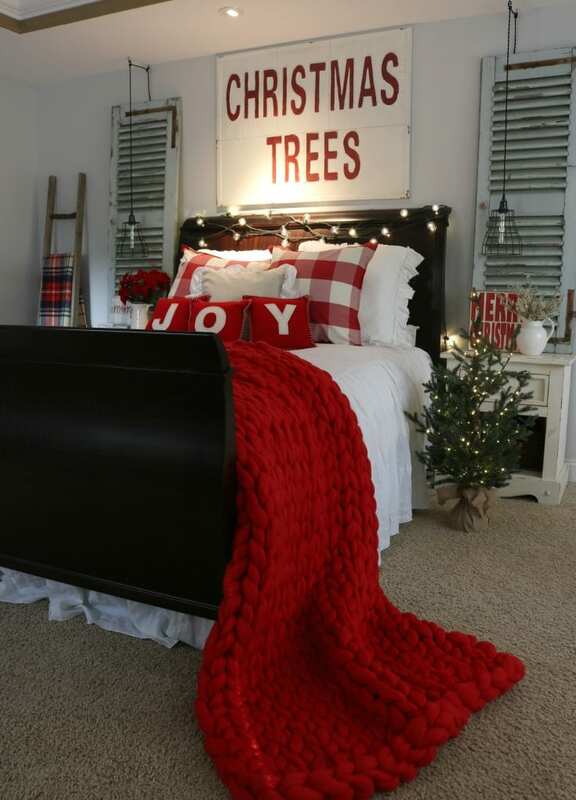 Here is another example of our amazing chunky knit throws from @becozi. This red one for Christmas has my heart. But she has them in a rainbow of colors, one just right for you. Save with TWINS10 and shop HERE. I sure had a lot of fun decorating my master bedroom. 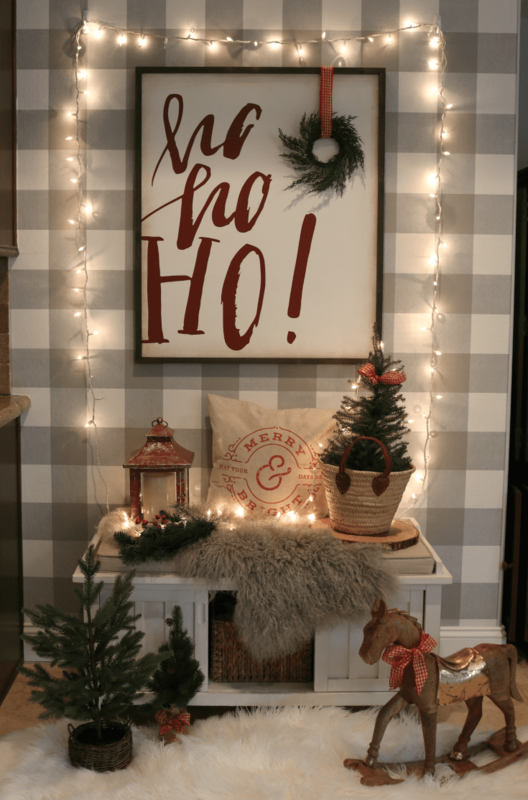 I’ve got the buffalo check theme continued with the cute black and white all-season layering sign from our friend Angie @greydotco We also have a savings code for all of Angie’s creations. Use THEDESIGNTWINS to save 10% and shop HERE. The “Glory To The Newborn King” sign is another beauty from @ohsweetskye that adds a gorgeous statement to any Christmas home decor. 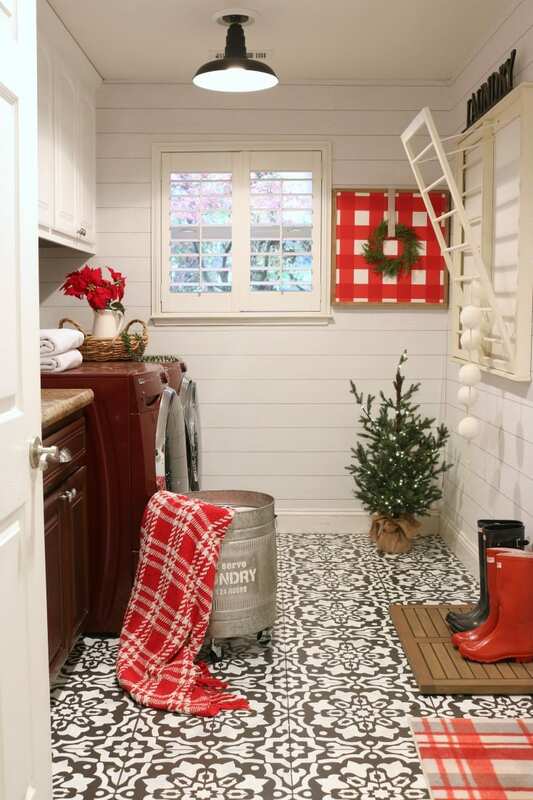 Every Christmas Home Deserves A Festive Laundry Room! 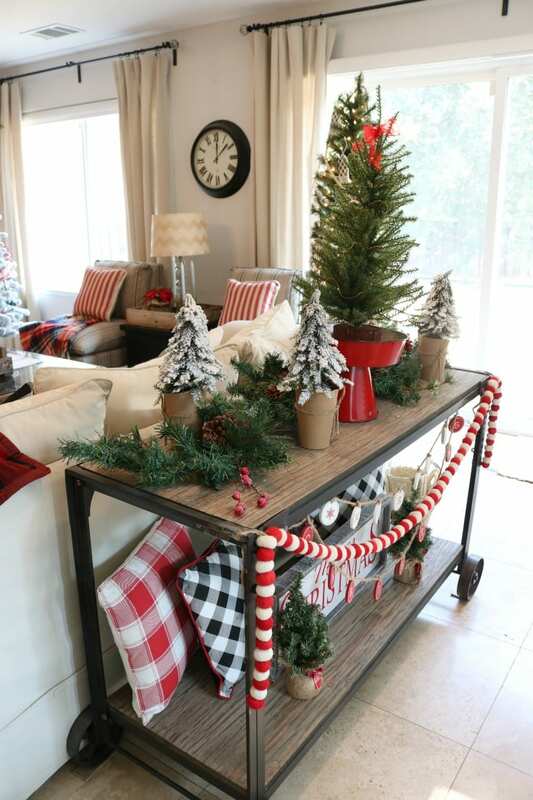 Even though I don’t decorate with red all year long I love to bring it out for fun during the holidays. And I don’t just mean Christmas. My red decor comes out for Christmas, Valentine’s Day, and the Fourth of July. So, in fact, my red decor gets quite a bit of use. And it always makes a fun festive statement. You can see how much fun you can have with these buffalo check “layering” signs. This is my red one from Angie @greydotco. Save using our code THEDESIGNTWINS and shop her complete collection HERE. Maybe one day Moki will grow up enough to understand how to pose. Until then all I get are “action shots”….oh well. I love him to pieces so I’m grateful all the same. 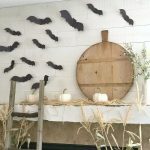 I transformed my laundry room last year. Follow my DIY Stencil Tile Tutorial here. See all the inspired elements of my Laundry Room Transformation here. I love this view. You know I have a ball decorating this rolling cart. 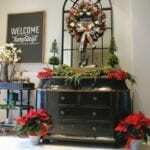 This Christmas my cart is decorated with darling festive decor from our amazing friends at Krumpets Home Decor. 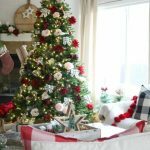 The wooden Merry Christmas sign, the hanging wooden Merry Christmas banners, the 4 pillows…all from their holiday collection. We love offering our followers savings on their already awesome prices. 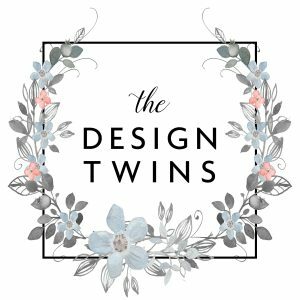 Use THEDESIGNTWINS when you shop HERE. They are offering free shipping on orders over $25 as well. In the photo below you can see a pretty good view of my drapes. These were my first big DIY project I did. They are all drop cloth curtains. I’ve had them for several years and they are amazing. I still love them and receive plenty of compliments on them. Follow My Easy DIY Drop Cloth Curtain Tutorial here. When in Doubt Light it Up! Don’t you love what a little festive lighting will do? EEK! The kids love coming in here now just to enjoy the glow. I must admit, I do too! Well I spoke too soon…look at my little cutie pie! 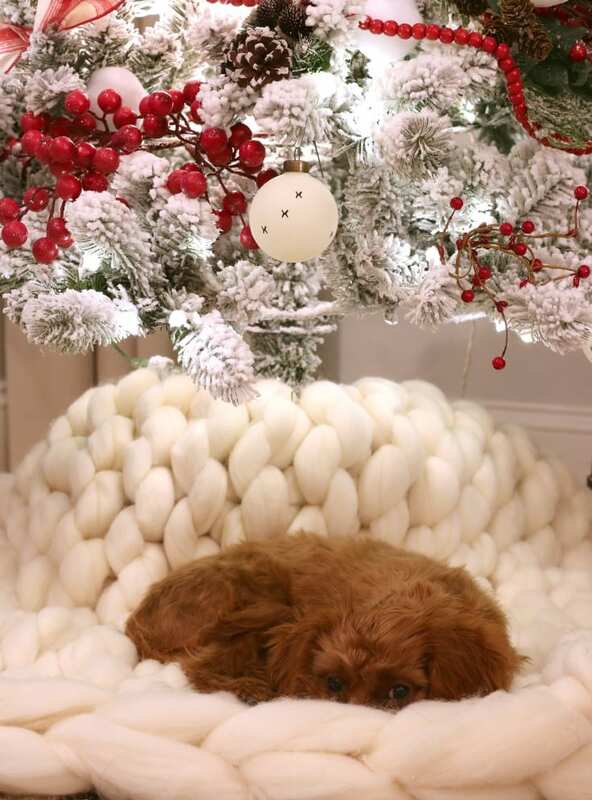 All nestled up on my luxurious chunky knit tree skirt….one can hardly blame him! Now, does this count as posing? All our trees deserve to float on a cloud of wool! If you agree shop for yours HERE. Don’t forget to use TWINS10 to save. …Merry Christmas to All…And to All A Good Night! Friends, we are truly so grateful for your love and support throughout the year. We wish you all the very happiest of holidays and lasting joy all year long. 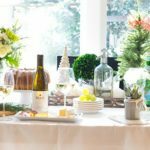 5 Tips To Be a Hostess with the Mostest this Holiday! I’m going to hop on a flight and come stay ok? 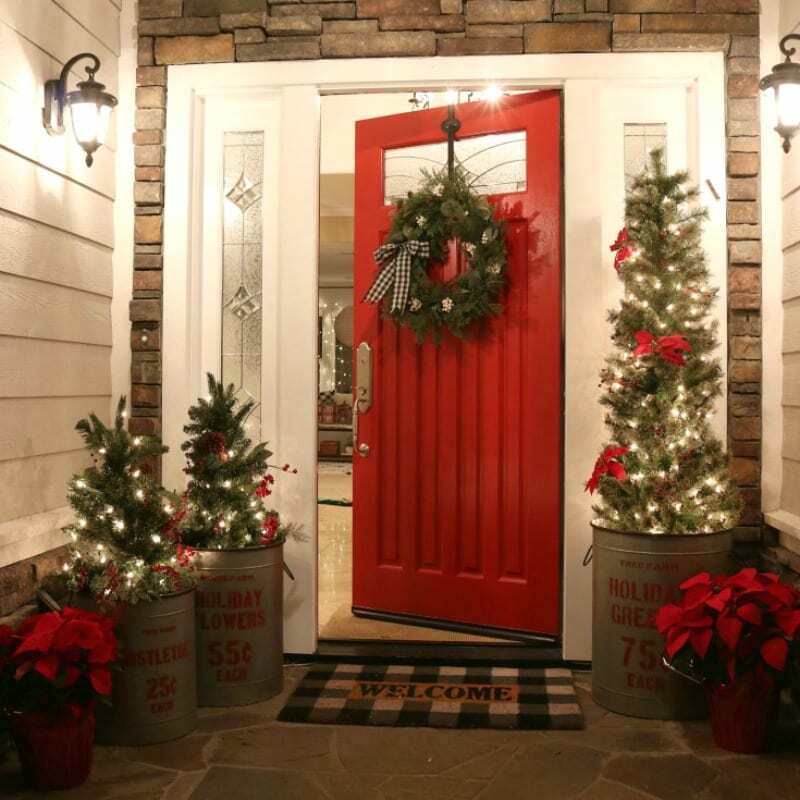 I LOVE the door red! And it’s just paint, so why not embrace change especially during the holidays <3 I absolutely adore it all! Stunning per usual! 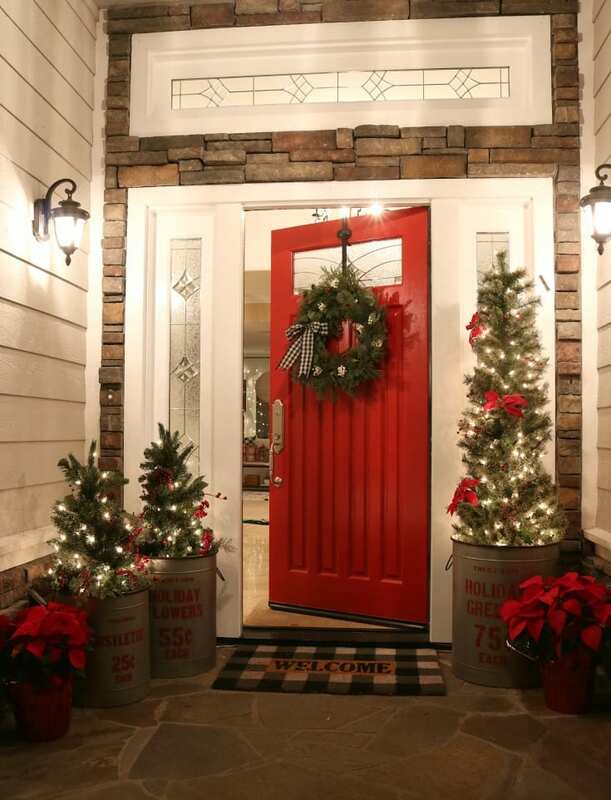 Oh my goodness, you had me at the red front door! Gorgeous plaid everywhere!!!! I adore every Christmas detail. You ladies are truly magical!!! I wish you and your families a blessed and merry Christmas season! It’s just a gorgeous home tour!!! Love it especially at night!! Buffalo Check This OUT 😂😂😂 You gals have my heart! Every share from you gals makes me feel like I’ve known ya for all the evers ❤❤ #Timeless. Thank you for sharing your beautiful homes and hearts with us all. I am ADDICTED to plaids at Christmas so y’all just made my soul pitter-patter 😍😍 Happy Holidays! Jodie, your house is beyond words! I love every nook and cranny! Wowza! I can’t wait to see it in person. Ok, did I just use three exclamation marks? Ok, your home decor deserves one more! I love all you festive decor! And you have inspired me to decorate our laundry room too! I have been so curious about the peel and stick wallpaper. It looks fabulous! 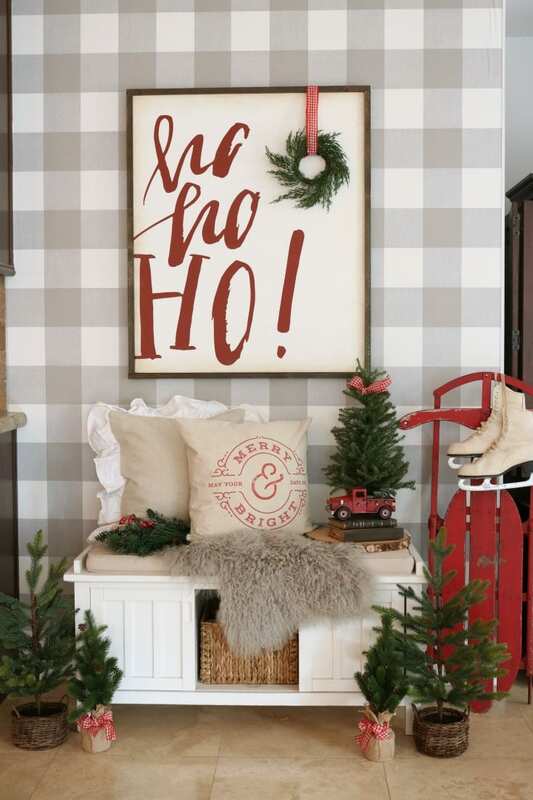 Your buffalo check is so festive and fun! 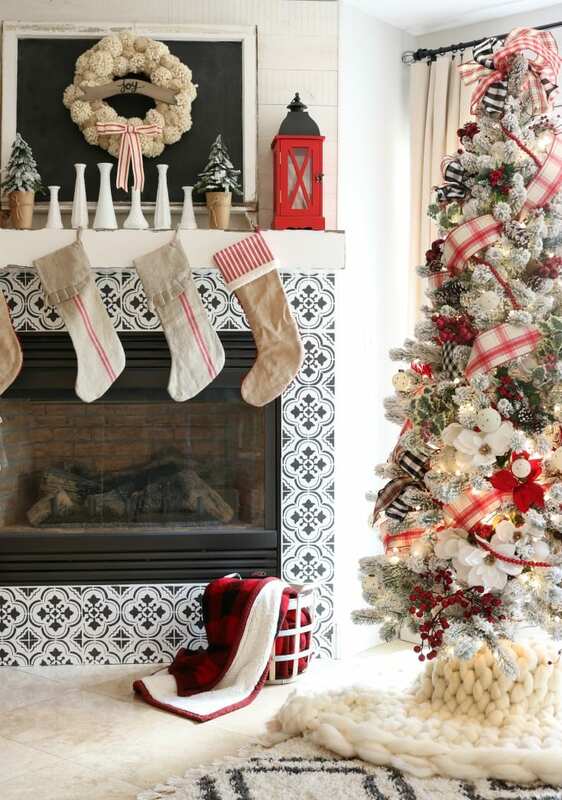 And the pops of red go beautifully with your black and white tiled fireplace!!! Oh my ladies! Christmas perfection! I adore every bit of it, starting at that beautiful red door! 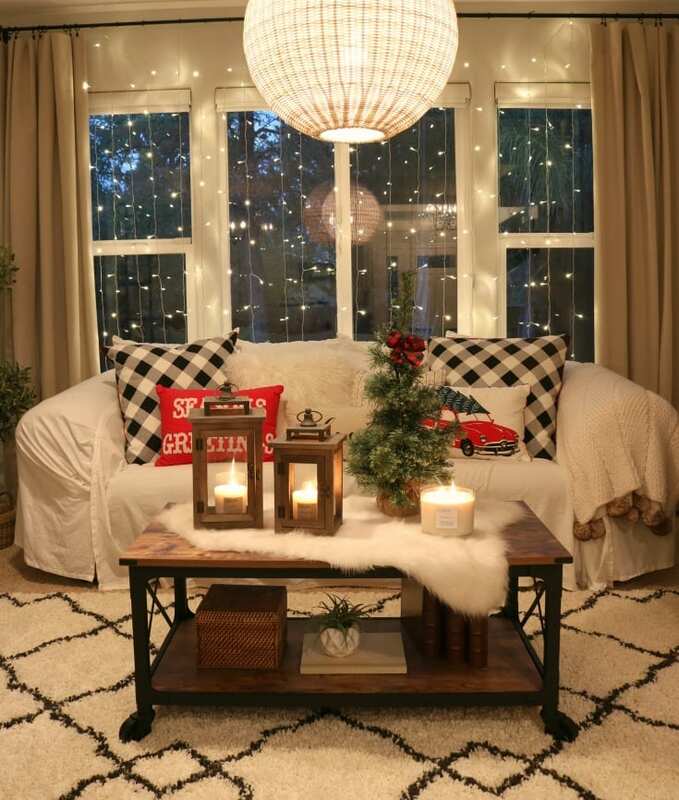 Such a lovely Christmas feel and I want to curl up on that tree skirt. 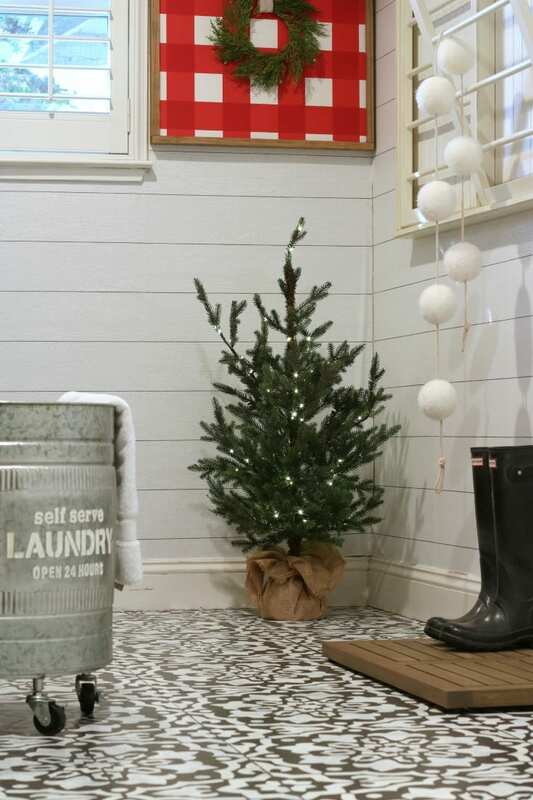 From the front porch to the laundry room…I love it all. 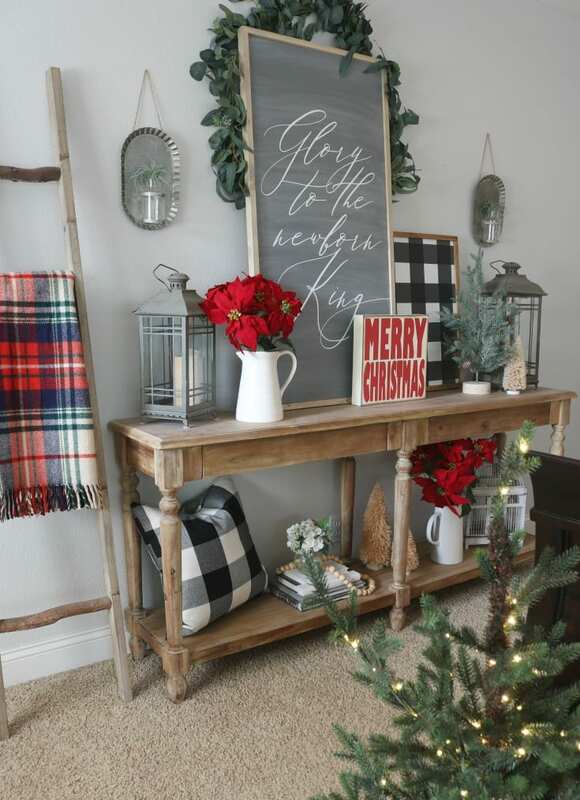 I’m so in love with buffalo check too and have the same color pallet throughout my home this year. It’s all so “happy” looking, festive and fun! Merry Christmas to you two lovely ladies! I truly love every single picture! It’s a buffalo check wonderland and should be in the most festive of Christmas magazines! Going back to gawk another time and pin pin pin! It seems so fun to be able to walk through your home and smile at everything. 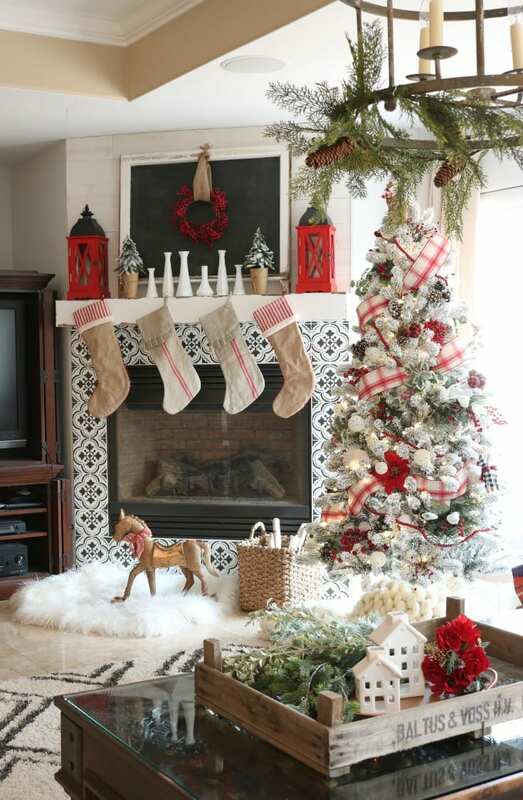 Even standing there at the stove and glancing over at the stool with the tree – it’s all adorable. Merry Christmas.